I went through a phase when I was about 13 or 14 when I made stuffed animals. 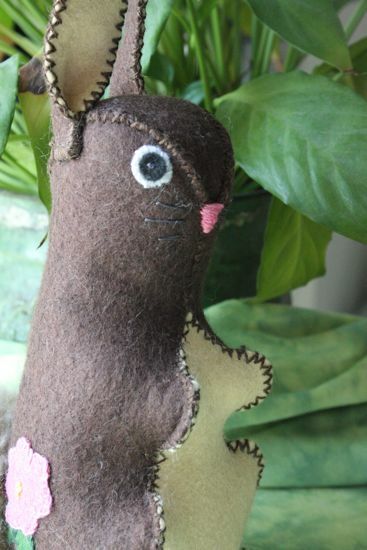 I was taking a sewing class as an elective in junior high and somehow there were these kits you could order: "fur", plastic eyes, stuffing, instructions. I made at least three of them: a cat, a turtle, and a parrot. I never did figure out how to not get the fur caught in the seams, so they all look a little weird, soft and fuzzy except where the fabric pieces come together. And then I finished the class, went on to high school, and didn't make a stuffed animal again for years. I've made a couple of patchwork bears in the last decade or so, but they hardly count since you can't play with them (the limbs are not sturdily attached, a flaw, really, when you are giving the bear to a baby). But mostly I've sworn off the animal-making, since the fur always got caught in the seams. There's probably a secret club out there of people who know how to sew pieces of faux fur together and not have the result look like a poodle-shaving session gone very wrong. A few months back, I ran into one of TipNut's lists, one about bunny projects. There are some seriously cute bunnies on that page, but one just jumped off the page at me, reminding me so much of The Velveteen Rabbit that I read Caitlyn the story that night for bedtime (yes, it still makes me cry). It wasn't enough. This bunny needed to come live here. 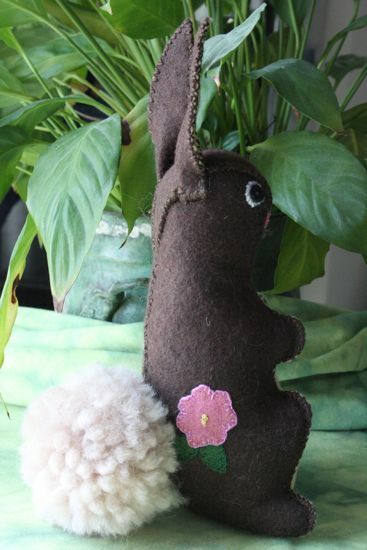 I'm pleased to say that I finished the bunny a week before Easter. Caitlyn told me yesterday that I didn't hide it very well. When I explained that I had made it because it reminded me of The Velveteen Rabbit, she named it Velveteen. Which sounds so much nicer than Felt, if you ask me. Love the bunny, and yes, let's do coffee sometime :) Hazel is always up for penpals, although getting her to actually write the letters so she gets one in return requires a bit of work on the grownups' part sometimes! This is one of the sweetest bunnies I've ever seen . . . and it has a pompom tail - how perfect is that?! I loved that sewing class and the stuffed animals. Clearly I have less attention to detail than you because I don't recall being annoyed at the fur caught in the stitches. I think my sister might still have the velcro pull apart cat I made for her.